Fully Featured yet Compact. A Printing Workhorse on a Desktop. Give your customers more than ever before...With Mitsubishi CP-W5000DW versatility through speed, capacity and multiple print sizes, together with our proprietary internal paper flipping method, plus our unique built-in horizontal and vertical paper cutter, the Mitsubishi CP-W5000DW duplex printer is perfect for printing custom photo books, greeting cards, flat photo cards, announcement cards, even customized calendars and more, on demand, allowing you to offer more products at multiple price points, thus making more profit. High quality prints with rich blacks and vivid colors. Large paper capacity, up to 250 8x12 or 300 8x10. The automatic horizontal and vertical cutters provides 13 different print sizes and with the Multi-Cut function, it maximizes the 8x12 print media. Providing you with the flexibility of multiple print size options from just one printer, offering maximum return with minimum investment. The Mitsubishi CP-W5000DW produces prints photos with remarkable clarity, vivid colors and high quality finish that will last a long time. Clearer prints with no blurring even in fine lines and details and no deterioration or compromise on original image details. The Mitsubishi CP-W5000DW can produces quickly handle large orders, so you don’t miss any business opportunity, the 8x10" dual side is printed in 75.4 seconds and 8x12" dual side isprinted in 83.9 seconds. 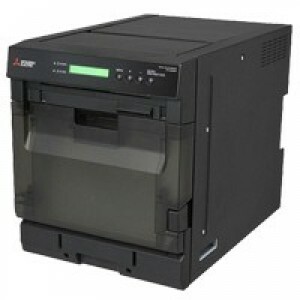 User-friendly front panel display and operation buttons allow you to easily check the status of the printer, remaining media, user notifications, etc. Dimensions (WxDxH): With Tray Approx. 13.5 x 31.3 x 15.8"
Without Tray Approx. 13.5 x 20.0 x 15.8"